Content: There’s a bit of mild swearing (s**t) being the “worst” one, plus some kissing and references to (adult) smoking. It’s in the YA section (grades 6-8) of the bookstore, but I wouldn’t mind giving it to a savvy 5th grader. I adored Nancy Drew as a kid. Seriously. I devoured them all. I loved the mystery, I loved Nancy Drew’s pluck. It was what I wanted. This, however, is Nancy Drew for the Modern Age: she’s sassy, smart, and street-wise. And I loved it just as much (if not more). 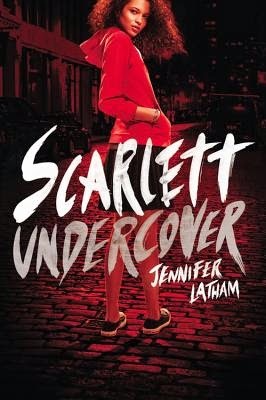 Fifteen-year-old Scarlett is many things: an orphan (dad was murdered, mom died because of cancer); brilliant (she graduated from high school two years early); Muslim; and, perhaps most importantly, a detective. No, it’s not really official: she mostly does inside jobs for the Las Almas police department, and sometimes she hustles and gets a case locating something missing. Nothing that prepared her for when 9-year-old Gemma walks through her door. Gemma’s worried about her older brother: something has happen to change him; he’s become distant, angry, and mean. But, more than that: Gemma’s convinced that her brother is responsible for the “suicide” of his (former) friend. And she needs Scarlett to find out what’s going on. Little does Scarlett realize the rabbit hole that she’s just opened up. One of the things I loved most about this book was that Scarlett came from a religious family (she wasn’t non-religious; she just wasn’t as religious as her older sister), and there was a huge support in the surrounding community. But, it wasn’t an issue: it was just who Scarlett was. She greeted people in Arabic, she said her prayers, she observed Islamic customs and traditions. And she solved cases. It was so perfect in so many ways. I also liked that she was sassy. She had an attitude, but one that suited her and the narrative, and it came through loud and clear. If I was my 11-year-old self, I would have adored Scarlett. (Which my mother may not have appreciated it.) I also loved that Scarlett, was capable: she got into some dangerous situations, and she had the know-how (and the tools) to get herself out. It’s really fantastic. There is a vague hint of the supernatural — talk of djinn and portals and such — but it didn’t develop in a speculative fiction way, which actually made me very happy. I love speculative fiction, but it would have been out of place here. I’m willing to talk this one up as much as possible; I do hope it finds a ton of readers. The diversity was great. My students are ALWAYS asking for murder mysteries, and this walked the line between edgy and appropriate brilliantly. Can't wait to have a copy for next year!